A finely detailed dragon defends its home atop a Celtic-inspired base, designed to collect the singed remnants of the past. 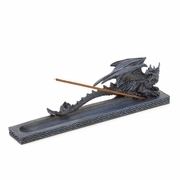 Infuse your home with the mystical scent of your choosing as this magnificent beast watches over the lighted stick. Incense not included. 10.8" x 2.88" x 2.62"